Spending within the UAE’s travel and tourism sector is expected to rise steadily over the next five years to be worth more than US$56 billion in 2022 as new mega-projects come to market, a recent Dubai Chamber of Commerce and Industry (DCCI) report has revealed. The analysis, based on new data from Business Monitor International (BMI) and the World Travel and Tourism Council (WTTC), found total spending in the sector is predicted to increase 4.5 percent year-on-year in 2017 to reach more than $42 billion. Growth within the UAE’s travel market will be supported by several recently announced projects including Marsa Al Arab, a $1.7 billion mega tourist resort near the Burj Al Arab, the new IMG Worlds of Legends theme park, a Formula One theme park at Dubai’s Motor City and Six Flags at Dubai Parks and Resorts, in addition to a number of planned shopping malls and cultural venues. 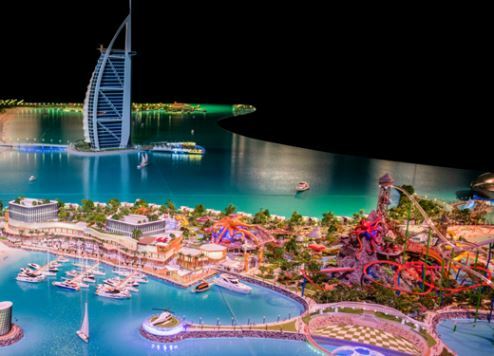 These mega projects fall in line with Dubai's preparations to host Expo 2020, diversify the emirate’s mix of leisure and entertainment offerings, and accommodate 20 million visitors in the city by 2020. The data revealed that tourism and travel accounted for 12.1 percent of UAE GDP in 2016, or $43.3 billion. Leisure travel spending amounted to $31.31 billion, or 77 percent of UAE’s total tourism spending in 2016, while business travel accounted for 23 percent, or $9.13 billion. Leisure travel spending increased at a compound annual growth rate, CAGR, of over 9 percent since 2011, and business travel spending rose at a CAGR of 10.83 percent over the same period. The data also found 14.9 million leisure and business travellers visited the UAE in 2016, representing a 4.9 percent increase on 2015. The number of visitors to the country has been growing steadily in recent years as source markets have diversified. The Middle East was identified as the largest source of visitors, accounting for 28.6 percent of total arrivals during 2016, followed by the Asia-Pacific region at 25.7 percent and Europe at 17.1 percent.